New York - Elie Wiesel called him a “God.” His investors called him a “genius.” But, proving correct that old adage from the country and western song, you never really know what goes on behind closed doors. Bernie Madoff, for at least 20 years, ran a Ponzi scheme on thousands of clients, among them the people you and I would consider the best and brightest. Business leaders, celebrities, charities, even some of his own relatives and his defense attorney were taken for a ride (this has to be the first time a lawyer was hosed by the client). We’re clearly in one of those historic, game changing years: up is down, red is blue and black is President. Aside from Obama himself, no person will provide a more iconic face of this end-of-capitalism-as-we-know-it year than Bernard Lawrence Madoff. Which is too bad. Yes, he stole $65 billion from some already quite wealthy people. I know that’s upsetting to them because rich guys like Bernie are not supposed to be stealing from their own kind. Crime, thievery, looting — that’s what happens on the other side of town. The rules of the money game on Park Avenue and Wall Street are comprised of things like charging the public 29% credit card interest, tricking people into taking out a second mortgage they can’t afford, and concocting a student loan system that has graduates in hock for the next 20 years. Now that’s smart business! And it’s legal. That’s where Bernie went wrong — his scheming, his trickery was an outrage both because it was illegal and because he preyed on his side of the tracks. Had Mr. Madoff just followed the example of his fellow top one-percenters, there were many ways he could have legally multiplied his wealth many times over. Here’s how it’s done. First, threaten your workers that you’ll move their jobs offshore if they don’t agree to reduce their pay and benefits. Then move those jobs offshore. Then place that income on the shores of the Cayman Islands and pay no taxes. Don’t put the money back into your company. Put it into your pocket and the pockets of your shareholders. There! Done! Legal! But Bernie wanted to play X-games Capitalism, run by the mantra that’s at the core of all capitalistic endeavors: Enough Is Never Enough. You have the right to make as much as you can, and if people are too stupid to read the fine print of their health insurance policy or their GM “100,000-mile warranty,” well, tough luck, losers. Buyers beware! It would be too easy — and the wrong lesson learned — to put Bernie on TIME’s list all by himself. If Ponzi schemes are such a bad thing, then why have we allowed all of our top banks to deal in credit default swaps and other make-believe rackets? Why did we allow those same banks to create the scam of a sub-prime mortgage? And instead of putting the people responsible in the cell block in Lower Manhattan, where Bernie now resides, why did we give them huge sums of our hard-earned tax dollars to bail them out of their self-inflicted troubles? 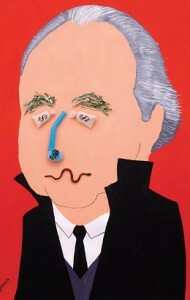 Bernard Madoff is nothing more than the scab on the wound. He’s also a most-needed and convenient distraction. Where’s the photo on this list of the ex-chairmen of AIG, Merrill Lynch and Citigroup? Where’s the mug shot of Phil Gramm, the senator who wrote the bill to strip the system of its regulations, or of the President who signed that bill? And how ‘bout those who ran the fake numbers at the ratings agencies, the lobbyists who succeeded in making sleazy accounting a lawful practice, or the stock market itself — an institution that’s treated like the Holy Sepulchre instead of the casino that it is (and, like all other casinos, the house eventually wins). And what of Madoff’s clients themselves? What did they think was going on to guarantee them incredible returns on their investments every single year — when no one else on planet Earth was getting anything like that? Some have admitted they did have an inkling “something was up,” but no one really wanted to ask what it was that was making their money grow on trees. They were afraid they might find out it had nothing to do with gardening. Many of Madoff’s victims have told investigators that, over the years, they have made much more than the original investment they gave Bernie. If I buy a stolen car from the guy down the street, the police will take that car from me regardless of whether I knew it was stolen. If I knew it was stolen, then I go to jail for receiving stolen property. Will these “victims” give back their gains that were fraudulently obtained? Will the head of Goldman Sachs reveal what he was doing at the meetings with the Fed chairman and the Treasury secretary before the bailout? Will Bank of America please tell us what they’ve spent $45 billion of our TARP money on? That’s probably going too far. Better that we just put Bernie on this list. At least Michael Moore is consistent in his ignorance! What an intelligent way of promoting socialism! Time magazine has really gotten on with their political agenda. Talk about an axe to grind!! I thought Barry Obama said we werent supposed to engage in class warfare anymore? Hopefully, like all the liberal media, it will go out of business soon. I guess Mr. Moore is against the cap and trade idea of the Obama administration. After all, it is just another way to encourage additional trading and the associated gamble for the value of a carbon credit. And what's wrong with a company making modest returns (profit) instead of ripping people off left and right with obscene wealth schemes like they did on Wall St. and elsewhere? And why should doctors and lawyers live off the misery of people by charging them outlandish fees of upwards of $400 an hour and more?? Do you think it's proper for people like Bill Gates and Warren Buffet and all those other billionaires to have that kind of obscene wealth while there are almost 30 million americans without health insurance?? And what about those people who are ripping off the system with section 8, medicaid and foodstamps? Who do you think is paying for that? It's certainly not the rich people who have a choice of parking their money outside the US and other tax shelters. It's the middle class who gets screwed because the poor don't pay taxes. Soon there won't be a middle class here in the US, just extremely wealthy people and the poor like they have in the repressive banana republics in South America and elswhere. When the majority of the governed feel that government is not looking out for their well-being and justice, then it won't be long before the goverened rebel wether openly or discretely (which has been happening for some time now). Michael Moore is a limousine liberal living a VERY FAT life (just look at his gerth). We see hm al the time on the upper west side where he sends his kids to private school, just like Barry Obama (but both make sure there are no private school vouchers for those who cant afford it as this is anti-union).